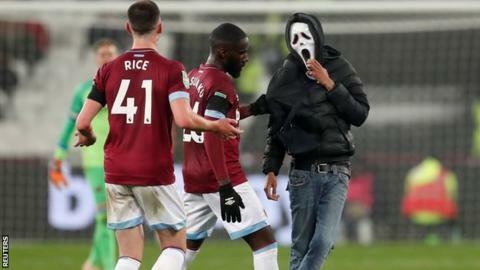 West Ham have given lifetime bans to two fans who invaded the pitch during Wednesday's 3-1 Carabao Cup defeat by Tottenham at London Stadium. The first incident came before Spurs' third goal, with the second shortly before the final whistle. Both fans were also arrested and charged by the police. "Encroaching the pitch is a criminal offence that will not be tolerated by the club," West Ham said in a statement. The Hammers will speak to London Stadium's operators as they try to find out how the fans got on the pitch. West Ham are tenants at the stadium, which is run on matchdays by LS185. They are still waiting to hear if they will be sanctioned by the Football Association for a pitch invasion and crowd trouble against Burnley in March. Five supporters were given lifetime bans after that incident.